Mo Rocca didn't have the chance to learn his grandmother's recipes before she passed away. So he's doing the next best thing: In My Grandmother's Ravioli, he asks other people's grandparents to teach him how to cook. I love a great barbecue, but don’t have the time mid-week to marinate the meat and fire up the grill. This easy recipe solves the problem. My secret to quick broiling the meat is to place a foil-lined baking tray under the broiler while the broiler preheats. The foil lining helps with quick clean-up. Placing the pork on a heated tray helps the meat cook faster. There are many flavored barbecue sauces. I like to pick a low-sodium one, about 390 mg for 2 tablespoons. Look for one that doesn’t have high fructose corn syrup as the first ingredient. If you prefer to make your own sauce, follow the added recipe below. 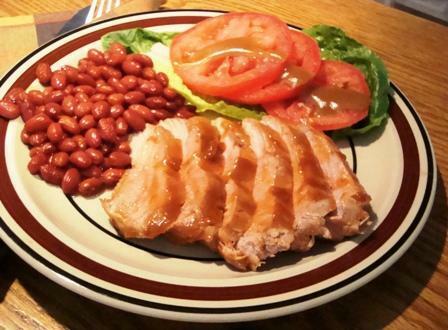 Boneless pork chops can be used instead of pork tenderloin. Place foil-lined baking tray under broiler while it heats. Preheat boiler. Line a baking tray with foil and place under broiler. Remove visible fat from pork and slice in half lengthwise. Do not cut all the way through. Open like a book and flatten with the palm of your hand. Remove tray from broiler and place pork on tray. Spread 2 tablespoons barbecue sauce on meat and broil 5 minutes. Turn over, spread 3 more tablespoons barbecue sauce on meat and broil 5 more minutes. Meanwhile, rinse and drain beans. Place remaining 3 tablespoons barbecue sauce in sauce pan over medium heat. Add vinegar, sugar and beans. Simmer 5 minutes to heat through and melt sugar. Place lettuce on a plate. Slice tomatoes and put on top. To serve, slice meat and place on plate. Pour pan juices over top. Spoon beans onto plate. Makes 2 servings. 03/13/14 - On the next Topical Currents, syndicated food columnist Linda Gassenheimer, special wine correspondent Fred Tasker and WLRN hosts Joseph Cooper and Bonnie Berman interview Martin Lynch from John Martin’s Restaurant and Irish Pub in Coral Gables. It's all about the pub's St. Patrick’s Day celebrations with on-air food tasting, lots o'laughs, and an Irish poem you don't want to miss. Tune in for Topical Currents special Food and Dining hour at 1pm on WLRN.